The imminent defeat of M23 rebels in the Democratic Republic of Congo is the result of shifting military and political dynamics that are presenting the most concrete prospects of peace in the vast, unstable central African nation for many years. M23 rebels in the east of the country have suffered major military defeats in the past week, forcing their political leader Bertrand Bisimwa to declare a ceasefire and seek a return to peace talks in Uganda. A defeat would send an intimidating message to at least 10 other rebel groups operating in the area, raising hopes that a lasting peace for the mineral-rich nation may be in sight after two decades of conflict. "M23 has only been the most active group in the east. Its defeat does not mean instant peace. It is early days," Stephanie Wolters of the South African-based Institute of Security Studies said. To understand the tenuous hope of possibly ending DR Congo's conflict, it is important to look at how M23 rebels were recently routed from its main bases by the Congolese army, a force generally known for its indiscipline, inefficiency and corruption. When M23 took control of Goma - the main city in the east with a population of one million - in November 2012, it embarrassed the government and put pressure on the international community to act after human rights violations emerged. President Joseph Kabila made changes to the military hierarchy and troops fighting in the east. In a sign that the changes might have started working, no reports of human rights violations blamed on the Congolese army have recently emerged, as has happened during previous operations. In March this year, the UN approved a new mission of 3,000 African soldiers with a mandate to fight the rebels. With the operational support of the existing UN Mission in DR Congo (Monusco), the new forces have used helicopters to target the rebels, allowing the army to advance on the frontline. It is expected that the UN mission will soon have drones for surveillance, a development that will offer insight into rebel movements and arms supplies. UN investigators have accused Rwanda and Uganda of supporting the M23. Both deny this. In what it says is a sign of goodwill that it wants a resolution to the conflict, Kampala has been hosting talks between Kinshasa and the M23. Jason Stearns wrote on his Congo Siasa blog that the absence of support from Rwanda to the rebels appeared to have tipped the scales. "The M23 was largely left to its own devices - the Rwandans just wouldn't pick up their phone calls," he posted, quoting an M23 leader. Ola Bello of the Cape Town-based South African Institute of International Affairs contends that for a long time, US military aid gave Rwanda "military and diplomatic carte blanche" in the regional conflict. The US has since withdrawn that military support, accusing Kigali of backing the M23 rebels, believed to use child soldiers. "This… shift in the regional diplomatic balance of forces has resulted in the Rwandan government's move to significantly scale back both its covert and overt support to the M23," Mr Bello said. It is, however, too soon to say M23 has been permanently pacified. For years, Kinshasa has failed to deal with rebellions in the east in any concerted way, partly because of the involvement of foreign actors. Kigali has said in the past it has sent its troops to DR Congo specifically to hunt down the FDLR - a Hutu rebel group linked to Rwanda genocide and which opposes Tutsi influence in the region. Unless DR Congo moves to deal with the FDLR, there is nothing to suggest that Rwanda would not be sucked back into the conflict, even if it stood back on this occasion. 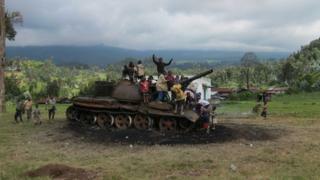 It has been alleged that DR Congo's army has worked with the FDLR to fight the M23. A comprehensive political process that seeks to address a series of issues beyond the armed insurgencies may save DR Congo. Ms Wolters said: "For years, Kinshasa has lacked the political will to really deal with the political problems for many different reasons. It is now up to them to decide what they want to do with the latest victory." Mr Bello said it was time that DR Congo acknowledged the significance of its neighbours in seeking solutions to the conflict in the east. "The M23's defeat… creates the political space to include all the conflict elements [economic motives especially] into a fulsome process of diplomatic negotiation between the DR Congo and its eastern neighbours and other conflict parties," he said. For the international community, the involvement of UN troops in direct combat may offer a model to reform peacekeeping missions to better protect civilians caught up in unrest and actively contribute to ending wars.